Microsoft has released a simple management pack for Windows Server Backup, available at http://www.microsoft.com/en-us/download/details.aspx?id=36390. However, if you are using the Windows Server Backup to Azure service, also known as Cloud Backup, you will discover an official management pack for this is not yet available. OpsMgr is the single pane of glass for your enterprise backup and disaster recovery (DR) components. In addition to the Windows Server Backup management pack, there are relevant Microsoft management packs for System Center Data Protection Manager (DPM), Virtual Machine Manager (VMM), Hyper-V, Exchange Server, SQL Server, and Azure. These management packs deliver the instrumentation necessary to monitor and manage all the Microsoft Cloud components delivering your DR services with OpsMgr. The OpsMgr Unleashed team is pleased to publish an additional simple management pack to cover Cloud Backup. 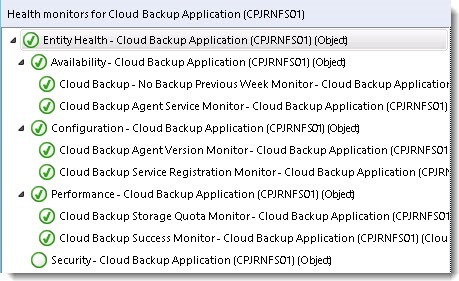 Now you can further extend OpsMgr to watch the health of your file servers protected by Windows Server Backup to Azure. Both sealed and unsealed versions of the management pack are contained in a single ZIP file. You can download the management pack ZIP file from this link: http://www.systemcentercentral.com/wp-content/uploads/2014/05/CloudBackupManagementPack.zip. The main feature of the management pack is a health model for each protected server as shown in Figure 1. FIGURE 1 Cloud Backup health model. In addition to the six alert-generating monitors in the health model, there are seven alert-generating rules. These are shown shown in Figure 2. FIGURE 2 Cloud Backup rules. The source for the alerts is listed in Table 1, which lists Event IDs for the Cloud Backup application. The type of OpsMgr alert (Critical/Warning/Informational) matches the level shown in the table. The backup operation has started. The recovery operation has started. The backup operation has completed. RECOVERY_SUCCESS_STOP_EVENT 4 The recovery operation has completed. Warning ENCRYPTION_KEY_EXPIRED 5 Encryption key is expired. Generate new encryption key by providing new passphrase from Machine settings. Informational MACHINE_REGISTERED_EVENT 6 The machine has been registered with Azure Backup service successfully. Informational POLICY_CHANGED_EVENT 7 Online schedule backup policy has been changed. Informational MACHINE_UNREGISTERED_EVENT 8 The machine has been unregistered with Azure Backup service successfully. Informational POLICY_DELETED_EVENT 9 Online schedule backup policy is deleted. Warning BACKUP_WARNING_STOP_EVENT 10 The backup operation has completed with warnings. Error BACKUP_ERROR_STOP_EVENT 11 The backup operation has completed with errors. Warning RECOVERY_WARNING_STOP_EVENT 12 The recovery operation has completed with warnings. Error RECOVERY_ERROR_STOP_EVENT 13 The recovery operation has completed with errors. Warning CBP_VERSION_UPGRADE_NTF_EVENT 14 A newer version of Windows Azure Backup Agent is required. Informational CBP_VERSION_LATEST_NTF_EVENT 15 Installed version of Windows Azure Backup Agent is the latest. Warning CBP_STORAGE_QUOTA_EXCEEDED_NTF_EVENT 16 Storage quota limit is approaching 80 percent. Informational CBP_STORAGE_QUOTA_NORMAL_NTF_EVENT 17 Storage quota is within limits. Error SCHEDULE_BACKUP_FAILED_EVENT 18 Scheduled backup failed in initialization phase. This entry was posted in Management Packs, Operations Manager 2012, System Center and tagged Azure, Cloud Backup, OpsMgr 2012. Bookmark the permalink. System Center 2012 Operations Manager Unleashed is on its way!